One of the things I find most frustrating is that I'm not particularly well-read. I went through a phase in my 20's when I started to read some of the classics and some more challenging modern fiction. I even bought Ulysses, but put it away until I was ready for it. Truth is, I don't think I'll ever be ready for it. I got fed up one day when reading some impenetrable passage of magical realism by an author whose name I cannot remember and picked up Julian Rathbone's The Last English King instead. This was different, this was...fun. And interesting. And very moving. From historical fiction, I moved on to factual historical books (again, something I read a lot of when I was a teenager)and also discovered a love for books about engineering and popular science. And that, broadly, is where my tastes lie now. In fact, my current reading list covers rather typical 40-year-old-male territory. By the side of my bed, should you choose to look there, you will find books on Alexander the Great, Anglo-Saxon England, Victorian Engineering, D-Day and disused railway lines. 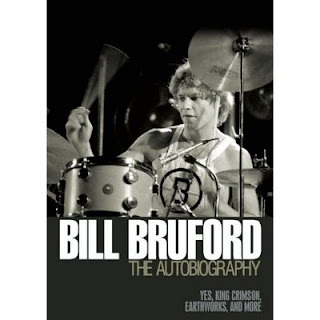 Oh, and also an autobiography by Bill Bruford. In fact, probably the only constant in my reading habits over the last quarter of a century has been books on rock music. And I think Bruford has just written one of the best of them. Bruford's book is not yer typical kind of book about rock. If you're after a straightforward canter through Bruford's musical life, then this isn't the place to start. Instead, it's a portrayal of the world-view of an unusually thoughtful musician coming to the end of his career. Sure, there are some interesting anecdotes in there about Yes and Crimson and Genesis, but this book is valuable because of its insight, because it makes you think.